With the help of fans and readers, LIGHTER became an International Best-Seller on June 29, 2017! This book is not just a great explanation of how we get overweight, and fantastic, specific strategies and techniques to lose the weight-it is straight from Erika's heart. She is so excited to empower all of us to be our true selves-free from the heaviness we have gathered in life – lighter! This book actually tells you HOW to do what you already know. I have read so many self-help books when it comes to mindless eating, but this one takes the cake. So many other books told me things I already knew, but didn't tell me how to keep doing those things long-term and didn't address the struggles one has with maintaining those habits. Erika actually breaks down lifestyle changes and habits to help you have long-term success. Her most simple tip is "eat only when you're hungry." I have been doing that for the past week and it's amazing how much less you eat when you follow this simple rule. I would highly recommend this book. Erika Flint has written an excellent book for anyone who is struggling with their relationship with food. She provides the reader with 31 practical tools and strategies for changes on how to lose weight and keep it off. The tools in her book are simple yet highly effective and are relatively easy to incorporate into ones daily life. Lighter is a book that provides real practical advice that leads to everlasting weight loss. Lighter is a powerful, step by step, tool that assists you in losing weight for life.Lighter is organized and concise to explain the process your hypnotist will walk you through to be successful for life.With Erika's help I have been very successful in my battle of the bulge.I'm enjoying my new self, doing the things I love and could not do in past.Bravo Erika!! Lighter has revamped my approach to weight loss. It's accurate to say I have a much "lighter" perspective now toward food and weight management. What I love most about this book is the "staying power" it has -- it's both practical and holistic, simple and profound, so it's definitely a book I'll have for life and that I'll continue to refer to through the decades. This is truly a powerful book for anyone who has a genuine interest in why they are over-weight and why other weight loss programs have not worked in the past. The explanations related to each of the 31 tools, why they work and how hypnosis helps are key to making huge changes in our attitudes towards food and ourselves. While hypnosis is not magic and reading this book is not magic, in concert these two tools will connect the dots in a way that you have never thought possible. This will be a go-to book for me for a life time of healthy approaches to life’s challenges which in the past always led me to food instead of what I really wanted in life. About once a week I find myself referring back to tips in the book when I run into a challenging situation or when I'm just not totally sure what to do. It has kept me on track far longer than any diet or exercise program ever did. I think that's largely because of how much I can tailor it to my unique needs/preferences. Chances are, if you struggle with weight management, this book has an answer to your specific issue. 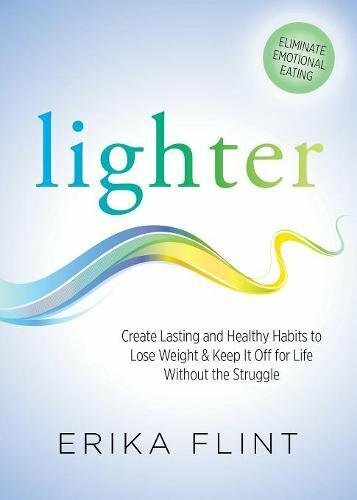 "Lighter" by Erika Flint is a well thought out book that breaks down and simplifies the skills one needs to break unhealthy eating habits and emotional eating (not that incorporating these skills is always easy)!!! It explains how your brain works, so you better understand why you have the habits you have and what you need to do to establish new, healthier habits. It also explains the importance of hypnosis and how it can help with weight loss.The book is broken down into three phases which makes it easier to focus specifically on the phase you are in. She provides 31 different tools throughout the three different phases so that the reader can figure out what tool(s) work best for them. She also provides examples and supplemental materials (including hypnosis audio recordings) which is very helpful.I started working with Erika several months ago and this book makes it easy for me to refer back to any part that I might need further clarification on, or to remind myself of what I need to be doing or focusing on. It can be overwhelming to break old habits and create new ones. Erika focuses on taking small, positive steps and moving the reader in the right direction. A must read for anyone wanting to lose weight, improve their eating habits and improve their quality of life. This book not only changed my thoughts about weight loss, but about success in general. It's a lot more than just a weight loss book...it goes far deeper into how lasting success is achieved. It's brought me closer and more quickly toward my weight loss goal than I ever thought it could - mostly because I'm able to work through challenges successfully using the tools in the book, and in particular because I don't get so discouraged and then comfort-binge now that I have other ways to soothe myself and stay motivated. My recommendation would be to read some reviews and then just read the book for yourself - there's no better gift to your loved ones than to get yourself lighter and stay that way. This book will show you how and provide tools for overcoming any impasse along the way. The Struggle Is Over with Lighter!Erika’s insight into how the brain works as well as putting her clients first, finding and helping them fulfil their needs is evident throughout this book. It breaks things down into easily understandable segments and the “tools” that she suggests really do work!I’ve tried to eat better many times, but in Chapter Four the comparison of a Campfire to Healthy Fats was a great way that I now have to think about the way I eat and its lasting effects. Also in this chapter, the explanation of N-State is a really helpful tool that I know I can make work for me!This book is an easy reading, well written “goldmine” of tools to help anyone struggling with weight issues get a handle on their lives and find the new person within that they can love and be proud of! Reading Lighter is a confidence boost for anyone on a weight loss journey. Her discussion of the conscious and subconscious brain lays the foundation for applying her insightful tools that all of us can apply on a daily basis. None of the tools take much more effort than to find the opportunity to quiet ones conscious mind, so that we can hear how our subconscious is directing us towards our goal.I love the practical simplicity that Erica Flint's Lighter introduces to the world. I will be sharing this book with my many busy friends who like me, often neglect to listen to what our inner wisdom is telling us.Thank you Erica for sharing your thoughtful, caring talents will the masses. Currently gaining insight from practicing tip #19. From the moment that you pick up "lighter," it is clear that this is different from most weight loss books. The title expresses how the reader wants to feel, and it is clear on each page that Erika Flint is passionate about helping people achieve this state of lightness, both physically and emotionally! Erika synthesizes weight reduction techniques into simple steps which will help the reader both achieve and maintain their goals by providing lifestyle changes that are easy to implement. Erika explains the techniques and why they work. She often explains why these techniques may be challenges for readers and how hypnosis can help overcome these challenges, and she provides audio hypnosis downloads to help the reader access their subconscious mind to begin the process of creating an image of their new lighter life! As anyone who has struggled with weight loss knows, the mental game can be exhausting and the ultimate undoing of any weight loss and maintenance plan. Like she did in Reprogram Your Weight, Erika Flint has written to the heart and soul of permanent weight loss in Lighter by narrowing it down to the simplest framework and providing a plethora of proven techniques to support this framework. What I enjoyed about this book the most was the ability to read it in its entirety and then go back and focus on the individual techniques that I wanted to strengthen in my own toolkit. As a certified hypnotherapist Erika has helped hundreds of clients as well as trained numerous other hypnotherapists. But her real gift is sharing kindness, love and light and providing a path to those who have lost hope. After reading Erika’s book Reprogram Your Weight, I was so eager to learn more from her! In Lighter, she helped me understand the tools I need to accomplish my fullest potential of slimness – and to do it with ease, grace and fun. Her writing still retains her tremendous warmth and sincerity, which I love. She obviously cares deeply, and wants to help people transform into their ideal selves.In Lighter, I love the internal techniques and strategies Erika takes me through. They help me manage my thoughts and emotions in ways that really serve me. Some of them are super clever! Plus she explains why they work, which helps the logical side of my brain trust them. I was motivated to read Erika Flint's Lighter, after hearing client testimonials from those who followed her "Reprogram Your Weight" program. It wasn't the weight loss, but the other life, brain, and outlook improvements that captivated me. This book made many things so clear to me, particularly:"The brain wants to feel good. If it doesn’t feel good, or needs a break, it will give you the idea for anything at all that does feel good, and for many people wanting to lose weight, the thing that does feel good is eating. And for many people that is the only thing that feels good, so the brain has no other choice. "I recognized my own brain's efforts to "take a break" with Twitter, email, and podcasts.Eating well generally comes easily, but movement, and leaving my house, does not. Now I realize that when I'm doing work that I enjoy, I'm do find it easier to get up and move, and I'm way less likely to procrastinate with my phone. With work I'm not genuinely motivated to do, all of that gets a lot harder.I found some fantastic guidance and illumination in this book, and I'm already feeling the results from being more mindful each day and incorporating what I've learned from the book. The structure of the book, and how it lays out the explanations, really helped me get the most out of the material. If you'd like to develop new habits to cultivate a healthier life, I'd recommend this book. 'Lighter' is such an enJOYable book, one I simply couldn't put down until the end.If you have ever struggled with your weight, and let's be honest - most of us have at some time, then Erika Flint's new book is something you definitely don't want to miss.By focusing on and developing just three (3) straightforward and simple Phases, it offers all the instructions you will ever need to allow your body to rebalance itself, naturally and easily.Written in an easy to digest (pun intended) way, 'Lighter' will teach you the step-by-step instructions to putting your emotional issues with food and weight behind you for good. Even more than that though, 'Lighter' is about showing us the way to live a life where we truly start to feel good and continue generating those feel-good feelings, that really make our lives worthwhile.This book is much more than a weight loss book. This book is about living your best life. Lighter in body, mind and spirit.I highly recommend 'Lighter' and it will be the book I give to all my future weight loss clients. I was a bit ambivalent when Erika had produced another book on weight loss through hypnosis: surely everything had been explained in her previous book?I was wrong. Where her previous book had been about how things worked and why we would gain weight while we would prefer to lose it, this book actually hands you the tools you need to go and actually do it.As such, it is a gripping, down-to-earth, tale of how weight loss could actually happen in your life with surprisingly low-threshold, easy to start techniques on how to implement change without forcing yourself into the latest fads and diet crazes.Finishing the book, which also comes withErika’s voice to guide you, there’s but one desire unfulfilled: can Erika generalize these techniques for us to also apply these techniques to other parts of our lives? Hopefully, there will be more books forthcoming. Right from the start, the book resonated with me. And as I read further, I became more and more interested in finding out more, and as a B.Sc. Nurse, I know what to eat and what to avoid, I have tried every trick, diets, and mind changing things there are, but this book kept my interest from the start to the finish and actually gave me hope that this time, I actually was provided with a logical and permanent solution to my weight problem.The book is written in an easy and understandable language and things are explained in details. There is a logical order of chapters that take you from just reading to actually wanting to start these steps and using those tools. All the traps from my former dieting, and trying to manage my weight are eliminated by this book all because of how this method is built up, and the combination of hypnosis as a support to this journey is wonderful.Erica knows what she is talking about, the nutritional facts, the combination of hypnosis with the weight loss tools in the book and old beliefs she challenges. All written with high professionalism and passion. She has the experience and the necessary helicopter view and is therefore, able to knit it all together for the perfect solution, and on top of that all it can be individualized as well.The best thing about this book though is that it is written with so much love for you that you actually feel it when you read it and that alone is very motivating for me. This book is not just about losing weight, it is actually a manual on how you love yourself and how to stop abusing yourself through food and your eating habits. Thank you, Erika, from the bottom of my heart for putting this book together. "Lighter" by Erika Flint is not just another diet book. Right from the start Erika makes you feel welcome and you know that she 'gets it'! All those years of your dieting, losing weight then gaining it all back and more, knowing what to do to shed those extra pounds but not being able to do just that.In "Lighter" Erika let's us know why we have struggled and it's not all about the food. It's about our feelings and behaviors and learning about what our feelings and our body's are telling us. "Lighter" gives you all the tools you need to make your weight loss permanent in easy to read, step by step chapters. With access to hypnosis downloads, what more could you ask for? Here are some of the things I am doing differently since reading Lighter.I only eat when I am hungryI don't think about food all the timeI don't feel guilty about eating or reprieved when I am not eating.I have other ways to calm, entertain and reenergize myself without food. I found this book to be very informative. It explains, in language I can understand, all the reasons why we have eaten too much food for all of our life. And then it gives solutions that work: whether through hypnosis with a therapist or self hypnosis (or both), explaining each option fully. It offers self hypnosis and/or meditation recordings (via online mp3 recordings) which help us to eat less food and move more, thereby losing weight at a steady pace. This book has helped me to become a thinner, more active me. There are so many POWERFUL messages in this book! And the concise way it's written allowed me to quickly absorb the information and start tailoring it to my particular needs. I was surprised at how much my attitude shifted, seemingly from the first page. All this time I've been going about weight loss in an effort-driven way -- often feeling like a failure if my outcome wasn't perfect. Lighter is the antidote to black-and-white thinking such as that (see tip #11 in particular). While I was reading it I could feel my "all or nothing" perspective fading and my inner equilibrium strengthening. Now that I better understand how my mind and behaviors are connected, I'm more aware of my underlying drives and triggers, which (along with the dozens of helpful tips throughout the book!) is helping me move in a lighter direction without much effort. And since there's not much effort, I know it's sustainable -- something the author says is essential for permanent change. It's been a pivotal and practical toolkit for me as I head into my forties and begin to prioritize my physical and mental health more than ever.